Tony Wolf System – A website on the Tony Wolf System of training for martial arts, self defense, stage combat and physical theatre. A website on the Tony Wolf System of training for martial arts, self defense, stage combat and physical theatre. Participants in a Wolf System workshop in Seattle, Washington, engage in a contest of timing and balance. The Tony Wolf System is an integrated approach to skill-based training in martial arts, stage combat, physical theatre and self defense. This website will introduce you to the system via its founder and his work in each of these fields. 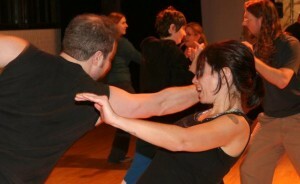 The Wolf System is a unique progression of co-operative exercises and competitive games, alternating between improvised and pre-arranged movement in a semi-structured format. Participants normally begin working solo or with partners, then progress into group or team exercises. Through the challenging, yet enjoyable task of mastering and then blending the games, participants develop physical ingenuity and confidence, tactile sensitivity, balance, stability and relaxation at the intuitive, “body knowledge” level. Depending on the particular course, these exercises thus provide a firm yet flexible foundation for technical skill development in recreational martial arts, self defense, stage combat and/or physical theatre training.